Sheffield United have said Wigan's on-loan star Lee Evans will be ineligible to face the Blades at Bramall Lane on Saturday. Evans, who signed an initial short-term loan deal at the DW Stadium before the move becomes permanent in January, looks set not be included in Paul Cook's 18-man squad for the trip to South Yorkshire. Sheffield United allowed Ryan Leonard to play against them for Millwall last month - which sparked brief hopes Welsh international Evans could possibly be available for selection at the weekend. But Evans looks likely to be watching on from the stands when he makes his first return to Bramall Lane since his summer switch. 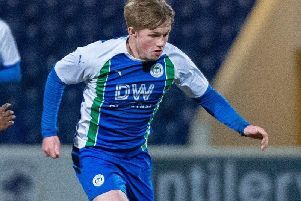 Unlike Millwall - who completed a deal for Leonard in the same loan-to-buy format on deadline day - the terms of Wigan Athletic's transfer agreement with Sheffield United do not permit Evans to feature against his parent club. Leonard almost haunted his parent club when he provided the assist for Lee Gregory at The Den to put the Blades 2-1 behind. But David McGoldrick notched a brace in the final 11 minutes to give Chris Wilder's troops an 3-2 victory in the capital. Paul Cook has a selection headache as Darron Gibson is still serving his three-match ban from his dismissal at Preston North End earlier this month. Callum Connolly, who has often been called upon from the substitutes bench by Cook this season, could be a replacement to fill the void in Evans' absence. Latics will be looking to break their away hoodoo after Tuesday's defeat at Millwall meant that Paul Cook's side have now lost five consecutive matches on the road.